In comparison with SK or stainless, tungsten carbide (WC) is more expensive and difficult to fabricate. However, depending on using, it keeps cost low and enable to better product than SK or SUS. Sometimes we suggest our clients to change their material from others to tungsten carbide. Many customers have been satisfied that change, so far. Especially we produce a lot of tungsten carbide drills. If you are interested in our tungsten carbide products, please let us know. 1. Excel in hardness and abrasion-resistant. 3. Possible to fabricate high-accuracy product by its rigid substance. 4. Possible to do powder buring from 1 piece. 5. Fewer strain and aged deterioration than other metals. We support your product development and processing techniques. We do design development for original machine and jig. Please do not hesitate to consult us at any time regarding your new products. We can process various special materials for prototype and volume production. Please ask us whatever you want. Following chart is part of our examples. ・Brittle materials, ceramic, rare earth and etc. From WC (tungsten carbide), we can process many materials as mirror-like finishing. Of course, we provide our product with high precision thickness flatness, and parallelism tolerance. 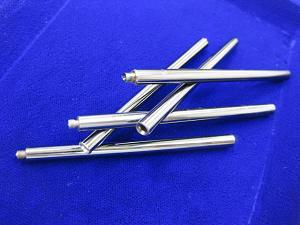 Plus, we can do it for superfine cylindrical pin that is impossible to do by taditional approaches. DLC stands for Diamond Like Carbon. It is amorphos conformation and carbon rigid film. The following four points summarize the most salient features of DLC coating. 3. Very thin film thick ness. Average is 1.2 micron meter. 4. If the material has good surface roughness, it has high adhesion. 5. Not good at shock. 6. Difficult to coat on bore diameter (caliber).